Our custom fit slipcovers are an affordable way to transform your living space. There are several reasons to slipcover a piece of furniture. You can give your furnishings a fresh new look at a cost savings, compared to reupholstering. 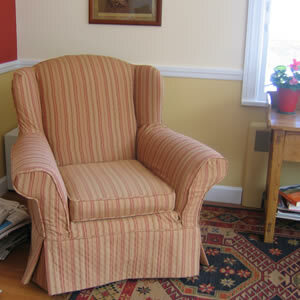 The slipcover look can be a pleasant alternative to upholstery. Clients enjoy the versatility of slipcovers. You can clean them. You can take advantage of having two looks for your furniture, the slipcover and the original upholstery, at different times of the year. We cut your furniture to custom fit in your home. We can fit tailored or casual depending on the piece, the fabric and your needs.